Your free initial consultation comes without obligation, and without high pressure. We will provide a free assessment and discuss your goals and ways we can help you to lose weight and keep it off. In order to answer any questions, a staff member will be calling you on the number you provided to gather necessary information before your complimentary consultation in the center. Your program will be individualized for you. 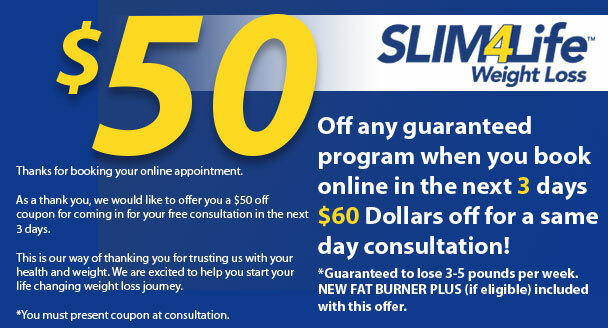 You will have a signed service guarantee from Slim4Life® guaranteeing your weight loss of 3-5 Lbs a week. Ask your consultant for details. Please print this coupon and bring it with you to your appointment to receive offer. Click here to see our outstanding weight loss results! These are some of the most common questions at Slim4Life®. We understand that you may have a lot of other questions, and that’s why we invite you to meet with a counselor for a free initial consultation. Also, please feel welcome call 1-833-Slim4life (1-833-754-6454) or reach out to your preferred Slim4Life® Location and let us answer your questions. What Do Others Say About Slim4Life® Weight Loss? This is a great question that we are always proud to answer. Thousands of clients since 1979 absolutely love Slim4Life® Weight Loss. Check out our testimonials and find out why. We’re glad you asked. Yes, we do! In addition to success stories of thousands of clients since 1979, we also have verified data audited by independent accounting firms. 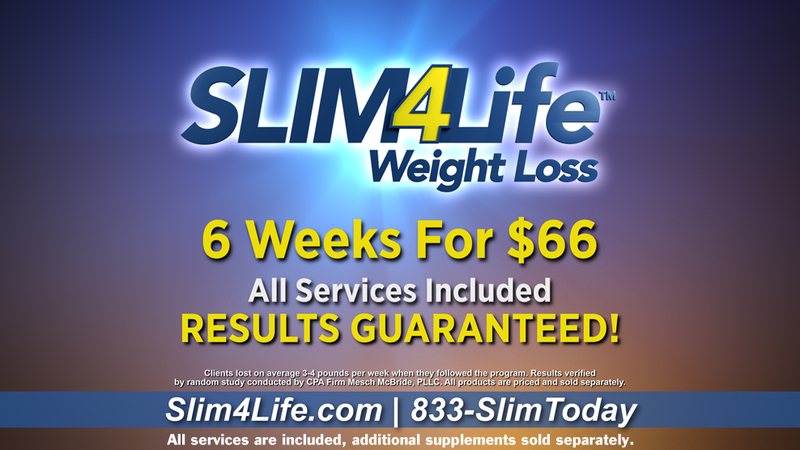 What is the Slim4Life® Program? Slim4Life® Weight Loss programs are comprehensive custom tailored programs for weight reduction. Our programs are professionally supervised for safe and rapid weight loss results. Our plans are nutritionally designed to help you develop proper eating habits for long-term success. We offer one-on-one counseling and supervision along with behavioral education for long term results. The initial consultation lasts about thirty minutes. It is designed to gather information from you so that we can design a program specifically for your individual needs. There is no charge for the initial consultation, and it is a great way to come and see if we’re a great match for you. Our programs are very affordable and can fit into anyone’s budget from students to professional business people. We invite you to schedule an appointment today for your FREE no-obligation consultation, so that we may assist you in your weight loss goals and present the current options available to you. There is no set fee for your program because all of our programs are individualized and based on your specific needs. At the time of your free consultation we will determine which program best fits your particular situation. Because the cost of the program varies with each individual, we recommend that you come in so that we can evaluate your needs and give you an exact price for the program. Absolutely. We have many children participating in the weight loss program. During the summer months we help transform children and teens before the new school year. It is very rewarding to see their lives change as a result of weight loss. Will I be eligible to do the program if I have medical issues? Yes. If you are a medical client we can work with your doctor on any guidelines necessary for your weight loss. We see clients from all walks of life, from diabetics to heart patients. Some of the more common medical conditions we see on a daily basis include diabetes, high blood pressure, heart conditions, high cholesterol, arthritis/joint pain, thyroid disease, and cancer. So don’t feel alone, we can help you. One of the most tragic health conditions is obesity, because it can be fixed. We’re here to help with that. Am I under any obligation during my consultation appointment? Absolutely not. The complete consultation is free of charge. What information will you ask me? We will ask you some questions about your medical history, eating habits and lifestyle so we can learn more about you to determine the best program to fit your weight loss needs. We like our clients to be in the 3-5 pound weight loss range per week. What kinds of food can you eat while on your weight loss programs? The great news about Slim4Life® is that you will be eating regular grocery store foods. We want you to learn to eat in all the food categories: proteins, fruits, vegetables, carbohydrates, fats, and dairy. At Slim4Life® Weight Loss, our programs also accommodate clients with special conditions related to food intolerances and we also have a great vegetarian plan. When you are finished losing your weight, your transition to maintenance will be easy and smooth and the education you receive will help you be Slim for Life! Will I have to attend group meetings? At Slim4Life® Weight Loss, we understand that your weight loss is not like anyone else’s. We do not have embarrassing group meetings. Our focus is on you. All of your visits at Slim4Life® are one to one visits and are designed around you. Who will I be seeing for my visits? At Slim4Life® Weight Loss, our centers are staffed with professional and well-trained counselors who go through extensive training and receive continuous education on our programs on an ongoing basis. Our counselors have varied professional backgrounds. Several of our counselors have actually participated in our program, reached their goal weight, and have made excellent weight loss counselors. All of Slim4Life® Weight Loss clients are seen on a first-come, first-served basis. No appointment is necessary, you come in at your own convenience when it is a good time for you. Do I have to eat pre-packaged meals? Slim4Life® Weight Loss programs use regular grocery store food that you can prepare yourself at home or that you can order in most restaurants. We do not make you dependent on expensive, pre-packaged meals. The whole family can eat the same way that you do, so you are not eating separately during meal times. Our focus is on teaching you healthy eating habits. At Slim4Life® Weight Loss, many of our clients have gone through bariatric surgery and need the assistance of a weight loss programs to teach them how to keep the weight off. We understand how important eating healthy nutritious food can be after surgery and how important proper nutrition will be for the rest of your life. We will teach you how to keep your weight off. No. You will lose weight without exercise. What typically happens is after the initial weight loss our clients are feeling so good they start an exercise program on their own! Although “exercise” sounds difficult to many people, it can be much easier and enjoyable when you are at the optimal weight.